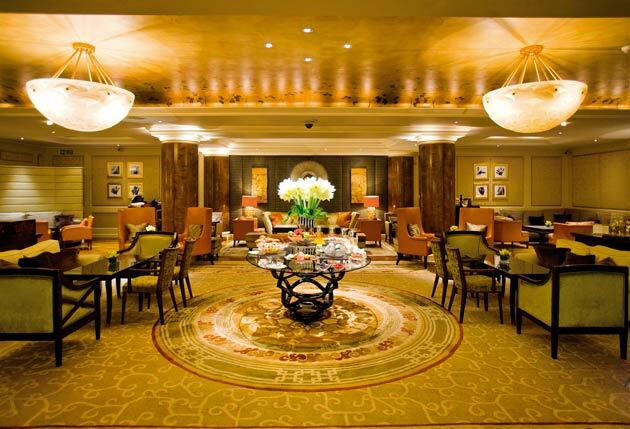 The Chinoiserie Afternoon Tea is held at the luxurious five star hotel Jumeirah Carlton Tower. This effortless sophisticated hotel is located in the heart of the highly prestigious Knightsbridge, where the most exclusive designer boutiques can be found (Chanel, Hermes on Sloane Square) and arguably two of London's most iconic and accredited department stores Harrods and Harvey Nichols. The Chinoiserie Afternoon Tea which is exclusive to the hotel, has been designed by Channel 4’s cooking sensation, Eric Lanlard. Eric has masterminded ‘Rêves d'Orient’; which offers diners a range of elegantly presented sweet and savoury pallet pleasures. The afternoon tea aims to take diners on a culinary journey through the enticing Middle East and Orient, while maintaining Eric's native French flair. 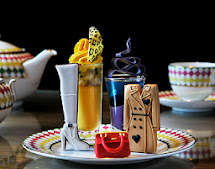 We loved the idea that this afternoon tea had a quirky edge to it, and an undeniable air of mystique so in early May 2012 we were booked in and eagerly awaited to be whisked away to the Middle East and Orient minus a flight. The Afternoon Tea, is held in the Chinoiserie room, which is soothing and spacious with a laid back feel to it. The backdrop for the Chinoiserie Afternoon tea has a live harpist, which is a beautiful yet novel touch which really compliments the settings (The Harpist plays between the hours of 3pm-6pm daily). We were shown to our table by our waiter, he was charming, friendly and eagerly explained to us the Chinoiserie Afternoon Tea in terms of the options which included Champagne if you choose and any dietary requirements that could be accustomed for such as dairy free, gluten free or seed free (Ideally twenty four hours notice would be preferred to fully cater for any dietary requirements). Our Afternoon tea began with a plate of lush, plump strawberries and a flute of bubbling champagne- a good old fashioned British cheers was in order! We sipped, chatted and indulged. Around the room people engaged in similar activities, as the beautiful music flowed from the harpist. The next stage of Afternoon Tea involved the actual afternoon tea itself. The emphasis of the Middle East and Orient is far from just a label, as we discovered. Just before our dinning experience begun the waiter sprayed an oriental perfume over us to get our senses flowing. Again a very novel experience, but enjoyable all the same. The Chinoiserie Afternoon Tea has a full range of teas to accompany your food, offering a range of green teas, fruit teas and infusions. With us selected the Darjeeling tea, which is described as the 'champagne of teas', which has a very rich taste and Winter Rose (large black leafs from China) which had an unmissable smell of fresh cut roses. The afternoon tea is comprised of three layers, and two of every item is included meaning if you chose to share the afternoon tea like we did you get to try everything and you are given free unlimited re-fills! This detail is sometimes missing from other afternoon tea experiences, and trust me I was delighted Jumeirah Carlton Towers included it because the afternoon tea looked undeniably scrumptious! The first tire contained the following sandwichs roast beef and horse raddish, cream cheese and cucumber, smoked samon and egg, the bottom layer contained plain and fruit scones with strawberry jam and clotted cream to accompany them. The Middle layer without doubt is the most enticing and according to our waiter the selections were inspired by Eric's traveling adventures were he was inspired by the beauty and intense flavours he came across. The desserts are as follows a pistachio financier with rose-flavoured cream (with a small edible rose on top), a lemon tart with raspberries and confirt lemon peel, a dark chocolate teardrop filled with chocolate mousse. The final touch on the two ends of the cake stand stood two lollypops which looked as if they had candy floss spouting from its chocolate body. These are infact from Afghansitan, one is filled with dark chocolate ganache and Amarena cherries the other filled with passion fruit ganache. I can honestly say I have never tasted anything like this before, it was incredibly sweet yet not sickly and the chocolate on the passion fruit lolly tingled in my mouth. We really enjoyed this afternoon tea! The food was really enjoyable, and bursting with flavour. Some favourite items in the afternoon tea were the pistachio financier with rose-flavoured cream and the lollypops. The combinations of presentation, taste and uniqueness behind them made the experience unmatchable. We highly recommed this afternoon tea! It really offers something unique, and includes alot of the features that we feel make an exceptional afternoon tea experience (great service, great food and a great atmosphere). This would be a perfect afternoon tea stop on a visit to London, while you take advantage of some of the greatest shops London has to offer in the surrounding area! Afternoon Tea by Eric Lanlard will be available at Chinoiserie throughout the year, with a new twist on the menu presented seasonally. An exceptional hotel to stay and enjoy afternoon tea. Dubai has been setting standards in various sectors including real estate and hospitality.